Enjoy the fresh, clean aroma of Wild Orchids as you drift into relaxation while soaking in the tub with our Wild Orchid Bath Salts added. These bath salts are also wonderful when used as a shower salt or pedicure foot soak. 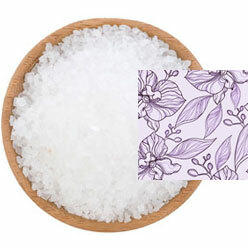 A fine/medium grain blend of Pacific Sea Salt with a soft, floral scent in a natural white color.